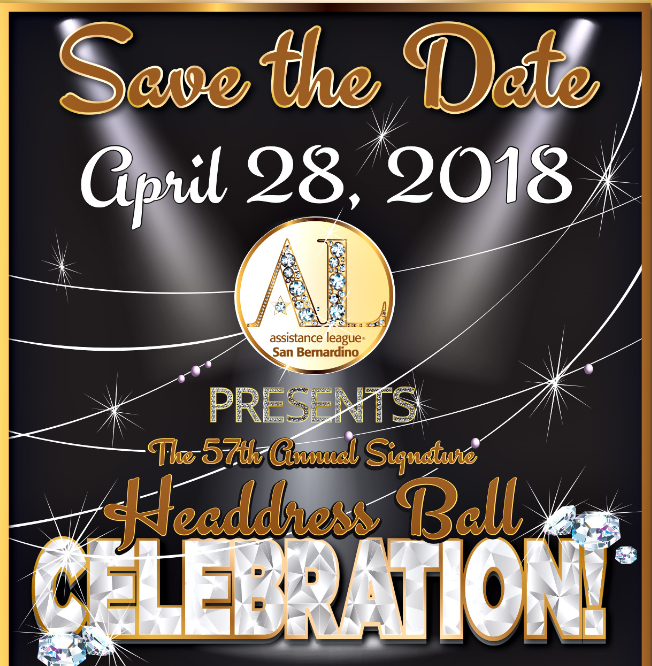 Join us for Assistance League of San Bernardino’s 57th Annual Signature Headdress Ball, “Celebration”. There will be a matinee performance at 9:30 a.m. that will include lunch and the presentation of the headdresses. The cost to attend the matinee is $75 per person. The evening gala celebration will begin with a cocktail reception at 5:00 p.m. sponsored by the Signature Club. Tickets for the evening black-tie performance are $150. Tables seat 10. The presentation of the headdresses is a 57 year-old tradition that has grown more elaborate every year. Community patrons agree to sponsor these magnificent designer creations with all of the proceeds going to charity. The headdresses can weigh 10-50 lbs. and can stand at a height of 5’-15’ before being placed on a model’s head. The headdresses are designed by local florists and artisans and they must be carefully balanced so they are wearable. The models who wear the headdresses are generally chosen based on their contributions to the San Bernardino chapter of Assistance League® and their community service. The members with the strongest service records are honored by the membership by being given the opportunity to model a headdress. For the past six years, this honor has extended to community representatives as well. The models then commit to rehearsal schedules that last for 10-12 weeks as they practice wearing tightly cinched corsets that brace the headdresses and distribute the weight primarily on their hips. A model must learn to balance the headdress while dancing in a fully produced number. This year’s models include Elizabeth Lock-Thomas representing the Girl Scouts, Kris Smith representing Les Confreres and Co-Chair of last year’s ball, Ashley Burroughs representing the Assistance League of San Bernardino, Leah Hertz also representing the Assistance League of San Bernardino, Barbara Heublein representing the Assistance League of Riverside, Tawnya Rhodes-Hensley representing the Assistance League of San Bernardino, Tick Tockers / National Charity League, Margaret Ortiz representing Assistance League of San Bernardino, Christi Price representing the Susan Komen Foundation, Judith Valles, a former Mayor of San Bernardino and the President of San Bernardino Valley College, and Cathie Siglow representing the Assistance League of Redlands. All proceeds from the matinee and the evening performances will go to benefit the children of San Bernardino through the support and funding of the Dr. Earl R. Crane Children’s Dental Health Center and Operation School Bell®, a program that provides clothing for children in need. Last year the Ball raised over $100,000. This year the organization is hoping to achieve a similar goal. For more information on sponsorships or to purchase tickets contact Elsa Carlton at (909) 792-8460 or Bobbi Simenton at (909) 862-0732 or you may send your reservations to 3617 Citrus, Highland, CA 92346. Make checks payable to the Assistance League of San Bernardino.